Teagan, Watercolor Artist & Writer — The Higgins Creative. Today, we're excited to welcome Teagan to the Journal! We had the pleasure of meeting Teagan on Instagram and then face-to-face on her and her husband's travels. She is just as bright & lovely as she seems in her artwork, and we're pleased to bring you a bit of background on how she got starting making and some insight into how she lives out #waketomake! I'm a wife, cat-mom, coffee guzzler and creative originally from Michigan, but now residing in Wisconsin. I used to hate cheese, now I love it. Go figure. I paint watercolors, calligraphy and write. My creativity always felt a little squelched growing up, and when I went to college I saw a watercolor piece on Pinterest and thought, "Hey! I'm gonna try that." And I was terrible. But thankfully I didn't realize how bad I was and I kept practicing until I had developed my own style and aesthetic. As for my writing, I've always wrote. I wrote about cats when I was little and to honest not much has changed. I actually just wrote a story with a cat in it, but it's more deep than the stuff I wrote in elementary! I went to college for writing and loved every minute of it! I loved reading other's peoples work and giving and receiving constructive criticism.But after college, I stopped writing because I really had no reason to write. That's why I started the Writing Collective. To give writers deadlines, to make them write. What makes you want to create? What keeps you going? For both writing and painting, it's all about using the gifts God has given me. And I know, that sound super cheesy and cliche, but it's true. If you think about it, God is the Maker. He invented the idea of creating things. So it brings Him glory when His creations, create. For me, it's a way I praise Him. Our creativity, our brains, our hands, they're all gifts from God and who doesn't like gifts? What two year old do you see smack away an ice cream cone when their parents hands it to them? NONE. Even when I don't feel like creating because I don't think I'm good enough, or because I think that my ideas aren't worth creating, I remember that God gave me my hands to use for His purposes and who am I to deny Him? Plus, painting and writing is an amazing way for me to work through my anxiety and depression, so I do it for selfish reasons too. Feeling like it's worth it all. Sometimes, as a newishly wed, finances are tight and when all I do is sit at home and paint or write I feel incredibly guilty and lazy. It's tough for me to see that the work I'm doing is real work and it is worth something, especially when sales are way down and I maybe make $15.00 in one week, or have enough publication denials to plaster my living room wall with. It's hard to keep creating when it feels like no one's sees the value in the effort you put into something. What advice do you have for other, perhaps newer, makers? Be you. Again, another cliche phrase, but I'm serious. Don't feel like you have to compare or compete. 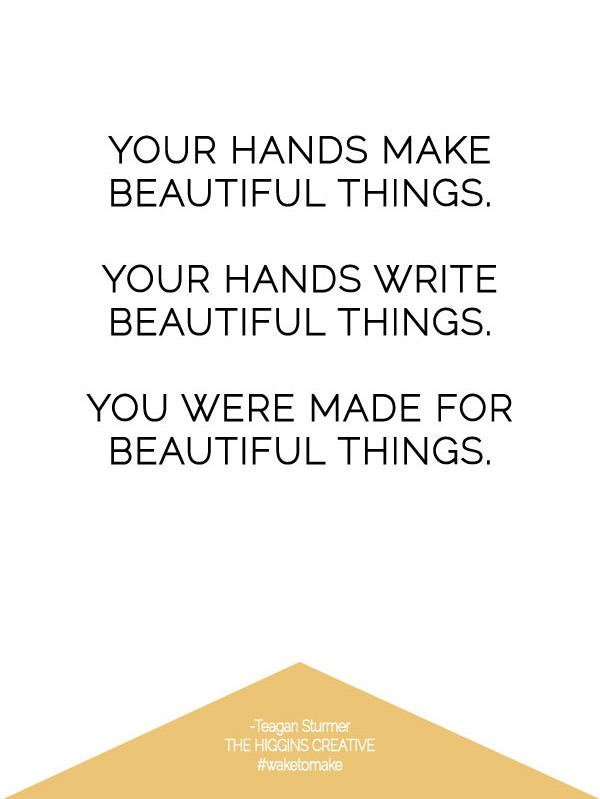 Your hands make beautiful things. Your hands write beautiful things. Your hands were made for beautiful things. When we compare and compete (I am guilty of it too) we end up killing our own creativity. And it's ok to not always be creating, take time to live too. Sometimes, we get so wrapped up in making sure we hit our deadlines and goals, that we forget to actually live. Live in your moments. Be the creative, alive. I would really love to connect with other creatives! If you need encouragement or anything shoot me an email, private message me on Insta or Facebook. Whatever it is, I want to grow my tribe and encourage them!! Be sure to catch up with Teagan on your favorite social network and leave her some love in the comments below. If you are interested in being a featured Maker, please fill out the form here.